Fifty years ago, commercial filmmaker George Romero marshaled the resources of his production company Latent Image and the talents of friends and colleagues to produce a low budget feature film in Pittsburgh, PA. The rest is, as they say, history. 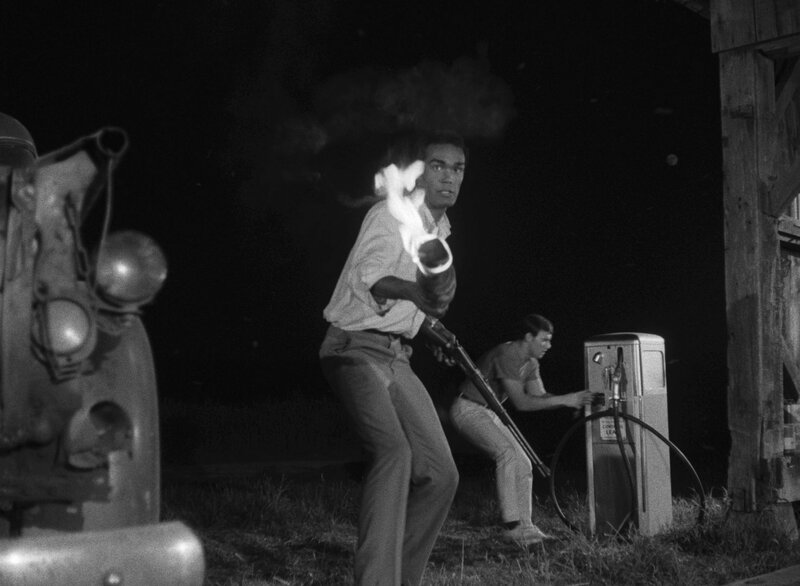 Night of the Living Dead (1968) is the first genuinely modern horror movie, shot more like a documentary of the apocalypse than the Gothic horrors that defined the sixties, and it bled right into the fabric of the culture. The plot is ingeniously simple: dead rise from their graves and feast on the living. There’s no exposition to frame it and the unstoppable army of flesh eating ghouls is made more terrifying by the complete absence of motivation or explanation; they literally come from nowhere. Barbra (Judith O’Shea) flees a stumbling ghoul in a panic to an abandoned farmhouse and becomes nearly catatonic as another survivor, Ben (Duane Jones), takes refuge and then takes action, boarding up the place as more of those shambling creatures gather outside. The casting of Duane Jones as Ben is one of the great moments of color-blind casting in American cinema. The part was not written as an African-American character and the dialogue has no references (direct or oblique) to race, yet it charges the dynamic within the house when the basement door opens to reveal a group hiding below, led by a bullying middle-aged husband and father (Karl Hardman). Romero has said in numerous interviews that he had never set out to create a racial commentary and he simply cast Jones because he was best actor to audition. He’s certainly the best performer on screen (the rest of the performances are acceptable and function just fine, but don’t offer any depth or nuance) and that alone invest him with an earned authority. Yet that choice gives us a black leader standing up to the familiar white voice of authority and establishing himself as the hero in a 1968 film without drawing attention to it. It is arguably the first genuinely modern horror film. The gore is tame not just by modern standards but by the measure of his own sequel Dawn of the Dead (1978), yet it is shocking for the era. The word “zombie” was never used (even behind the scenes the walking dead were referred to as ghouls) but the film launched the modern zombie genre, transformed from the Haitian concept of men transformed into sleepwalking slaves by drugs, magic, and hypnosis to the reanimated dead driven to devour the flesh of the living. It defined the core of the zombie myth, even if it’s not explicitly stated, and the existential fear that defines the genre. The strains of panic and helplessness twist the tensions of human survivors to the breaking point, like low rent Beckett snuck into an exploitation thriller. There are echoes of Vietnam in the imagery and reflections of America’s volatile race relations in the conflict within the house. But it’s still the primal kick of the flesh feast that gives this grisly spectacle, of society feeding on itself and the nuclear family devouring its own, a place in our collective nightmares. 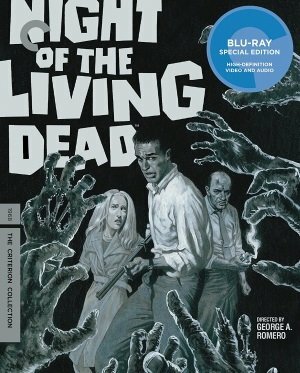 Night of the Living Dead changed the face of American horror movies: for better (it blazed the trail for the transgressive horror renaissance of the seventies, seeded Romero’s own sequels, and inspired everything from 28 Days Later to Shaun of the Dead), for worse (all those crappy copycat zombie knock-offs), and forever. There are numerous cheap, substandard copies around but the definitive release of the film was produced by Criterion for Blu-ray and DVD and streaming on The Criterion Channel with many of the disc supplements. Thanks to a copyright issue that cost Romero and his colleagues ownership of the film, decades of cheap copies on film, VHS, DVD, and digital editions have given many the impression that is was a rough, raw, black and white horror hewn by amateur filmmakers with primitive equipment. Even after some fine editions with high-quality transfers of good elements produced for home video over the past couple of decades, the reputation lingers. In fact, Romero and his filmmaking team brought the resources of their commercial production company Latent Image and their experience from years of producing TV commercials and industrial films. It was a first feature, yes, but they were professionals and they delivered a very good-looking production that made the most of limited resources. You can see their professionalism in Criterion’s beautiful new disc, presented in a new 4K restoration from the original camera negative with a transfer overseen by the Romero (before his death last year), co-screenwriter John A. Russo, sound engineer Gary R. Streiner, and producer Russell W. Streiner. This clarity helps us see the detail that enriches the film. Romero creates tension and action within what would otherwise be static scenes through defining activity. In the exchange between Ben and Barbra sharing their stories, Ben is never still. He moves back and forth across the room, gathers materials to board up windows, breaks up and moves furniture, and Romero takes his camera handheld to get in close and move with him. It pulls us into the immediacy of the moment and Ben’s sense of purpose, creates a sense of anxiety and panic even when we can’t see the creatures outside, and propels the film forward with a jittery, adrenaline-boosted rush. Criterion packs the release with a great collection of supplements, many of them never before seen or produced for this edition, on two discs on Blu-ray and three discs on DVD. The film is accompanied by two optional commentary tracks, both recorded for the original 1994 laserdisc release by Elite. One track features director George Romero, screenwriter John Russo, and co-producers/co-stars Karl Hardman and Marilyn Eastman and focuses on the technical and production aspects of the film, and the other is a cast reunion with Bill Hinzman, Judith O’Dea, Keith Wayne, Kyra Schon, Russell Streiner, and Vince Survinski. New to this edition is Night of Anubis, an 82-minute workprint rough cut of the film, with sound takes from the finished film and matched as best as possible. It’s rough all right, with splices and grit and markings throughout, and is missing part of the second reel while it is mostly for obsessives, it helps show some of the creative choices. There’s an optional video introduction by co-producer Russell Streiner. And for all those contrarians who insist that the film should only be seen in bleary, scruffy editions, this is the real thing, not a cheap act of theft. All the defects and damage and visual inadequacies are organic to the filmmaking process. Embrace it. On the second Blu-ray, Criterion presents a collection of new featurettes produced for this edition. Frank Darabont, Guillermo del Toro, and Robert Rodriguez are interviewed for “Light in the Darkness” (23:41), discussing the impact and influence of the film on their own work and on the film in general. In “Learning From Scratch” (11:58), co-screenwriter John Russo discusses the origins and history of Romero’s company Latent Image. “Walking Like the Dead” (13:14) interviews the extras who played the ghouls, including “the graveyard ghoul” (Bill Heinzman) and the little girl in the basement (Kyra Schon). “Tones of Terror” (11:15), narrated by Jim Cironella, explores the score and Romero’s remarkably effective use of library music. The video essay “Limitations into Virtues” (11:57) by Taylor Ramos and Tony Zhou examines the style of the film and compares key images to similar techniques used by Romero the Latent Image commercials. On the archival side, there is a never-before-seen 18-minute reel of 16mm workprint footage with an option introduction by the film’s sound engineer Gary R. Streiner, and silent “TV Newsreel” footage (3:28) shot by news cameraman during shooting of the sheriff and posse scene. It’s the only behind-the-scenes footage known to exist of the production and you can actually see Romero with the camera and giving directions. “Higher Learning” (45:30) is an onstage interview with George Romero at a screening of Night of the Living Dead at the 2002 Toronto International Film Festival and there are excerpts of George Romero with fellow filmmaker Don Coscarelli with Tom Snyder on “Tomorrow” (18:20) from July 3, 1979, and a brief newsreel clip on the “Venus Probe” (32 seconds) that was referenced in the film. The audio-only interview with actor “Duane Jones” (21:56), conducted by journalist Tim Ferrante in 1987, features content not included in previous presentations of the interview, and there is also a 1994 interview with actress Judith Ridley (10:42) originally produced for the 1994 Elite laserdisc. Also includes trailers and TV spots and an accompanying fold-out insert with an essay by Stuart Klawans. Discs provided by Criterion for review purposes.